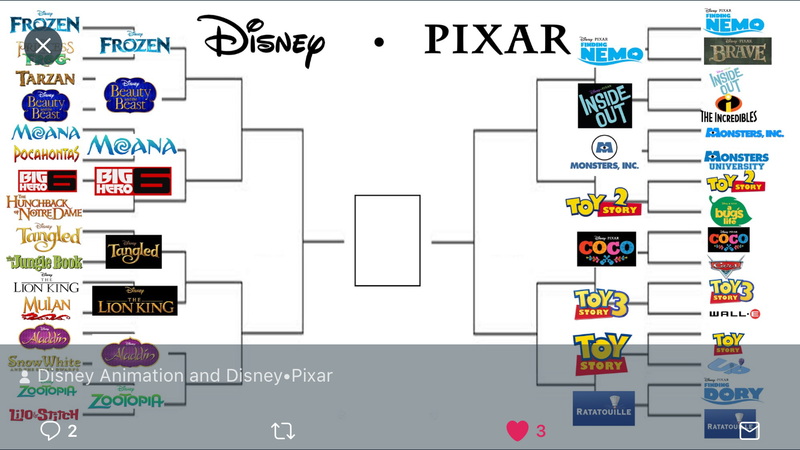 Today, @smjxmj posted a Pixar v. Disney bracket on Twitter. It’s a great idea, but I thought the seeding structure was way off, and his results were mostly off. (His championship was Monsters Inc over Mulan. All-time great movies like Frozen and Moana faced off early. It also wasn’t clear who was a #2 seed, etc.) So I suggested seeding in an objective way, based on gross box office, rather than seeding by subjective quality. I thought this would set up some interesting quantity (of cash) vs. quality match-ups. With my friend Josh Tate’s help (fellow legal historian with more twitter-ological chops than I have), you can vote on our brackets on Twitter! Find at @jedshug and @JCTate1215 to vote on Twitter polls. Based on a little research, here are the seedings on the Pixar side, adjusted for inflation. And on the Disney side, here are the rankings, but not adjusted for inflation, because then the list would almost entirely from the 1930s-50s in the top 10. So that set up a bracket, and my friend Josh Tate created these graphics. I’ll add my analysis to this post for round 1 match-ups, drawing on my experience watching lots of movies in my own Disney childhood and with my three kids born in the Pixar era and the Disney revival. Round 2 is forthcoming! #2 Finding Dory v 15 Ratatouille: UPSET ALERT! Ratatouille is terrific. I like Ellen, but I found Dory to be unbearably annoying in Nemo. I successfully avoided taking kids to Dory. 15 RATATOUILLE FTW! Bracket buster! #3 Toy Story 3 vs. 14. Wall-E. This is one goes down to the wire. Both are great. But Toy Story 3 was outstanding on every level, and wrapped up the series so appropriately. I laughed, I cried, it was better than Cars. (See what I did there?). Toy Story 3 wins a buzzer beater. Survive and move on, Woody and Buzz, just like you survived Lotso and that incinerator. #4. Toy Story 2 vs. 13. Bug’s Life. Lay up. Over after the first half. Toy Story 2 wins. #5. Monsters Inc. vs. #12. Monsters U. Wow, the seeding worked out! In basketball, a #12 (underdog from a mid-major) often upsets a #5 (mediocre team from a big 5 conference). But not in this Pixar bracket. Monsters Inc. wins. #6. Coco crushes #11 Cars. No analysis necessary. #7. Toy Story vs. #10 Up… How did this unfair seeding happen? Up is wonderful. The first five minutes of Up were unforgettable. I want to call an UP-set (see what I did there?) But Toy Story is better, funnier, more complete, and better for kids (that’s the bottom line). So when 17. Princess and Frog takes on the all-around #1 FROZEN, it’s a stone-cold blizzard of threes and a defensive freeze. They also ice them at the line. Frozen skates on to the second round. #2. Zootopia over #15 Lilo and Stitch. (I only saw parts of Lilo and Stitch while juggling kids. It was meh. Zootopia is a solid movie with a message. But Sloth wasn’t funny. #4. Big Hero 6 vs. #13. Hunchback. Wow, that’s a clash of genres and eras! BigHero6 plays modern up-tempo offense vs. Hunchback’s old school D, and wins with a coast-to-coast buzzer-beater lay-up. Old school fans can disagree, but this is my Twitter feed and my blog. #5. Moana v. #12. Pocahantas. Moana is an all-time great movie. Auli’i, amazing debut. The Rock stole the show. And Lin-Manuel? Island hopping from Nevis to Manhattan to the South Pacific with magic. And sorry, Pocahantas, you weren’t that great a movie anyway. Volcanic blow-out! Moana *sails* on to round two. #7. Aladdin v. #10. Snow White. I love Robin Williams. Always have, always will. And those dwarves can’t rebound or block many shots, even if you put all seven of them on the court. Aladdin pulls a genie out of a bottle for the win. Next Next post: Trump and Dowd may have attempted to obstruct justice with pardons.